Today I split the hive. It was full of bees, at least 5 frames were covered in each hive body. There wasn’t a lot of capped honey but I saw frames with every cell half full of nectar. Likewise not lot of pollen stored, but foragers were bringing it in left and right. There was capped drone brood, and what looked like some swarm cells. 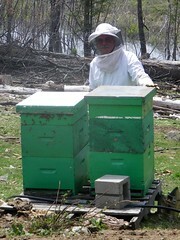 I prepared basically a complete two-super hive, with top feeder and fully drawn comb. We had four hives at one point, so it was easy to cherry pick. I smoked thoroughly and took the top hive body from the existing hive and put it on the new bottom board. 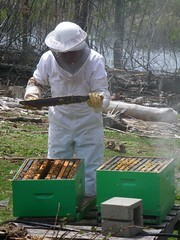 I then made sure that both hives had everything they needed. 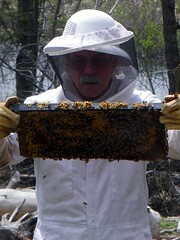 All the brood was in the top hive body, as well as most of the capped honey and pollen. There was plenty of uncapped honey in the lower body, as well as what looked like enough pollen given the way it was coming in. I gave the bottom body two frames of brood. My aging eyes and “transitions” lenses don’t actually let me see eggs anymore through the veil, but there were some very small larva as well as cells that I hope were only ‘apparently’ empty. That ought to be enough to raise a decent queen even if I’m wrong about the swarm cells. The queen was probably in that top super, but might well have fallen down when I moved it. With eggs in both hives, it doesn’t matter who got the queen. I gave each hive a new deep super with drawn comb so they don’t have to waste effort on wax, and put syrup in both feeders. Most of the traffic is going to the original site, but it looks like there’s enough to the other for it to be viable. I find it interesting that the bees are still coming out of the original hive between the top body and the feeder even though there’s a new top body and I carefully scraped the feeder. Since I was cleaning up all those frames, I thought it would be a good time to try out our idea for melting wax. I put a piece of Lisa’s permanent cheesecloth into the purpose-bought $4.00 slow cooker, loaded it with wax and set it on low. Three hours later, it smelled funny. The wax had melted nicely, but so had the plastic cheesecloth. Also, the wax seemed to be boiling which had not been on the plan either. I’m letting it cool off while working out the next try. I’m thinking butter muslin, which is real cotton and thus shouldn’t melt, and wondering if I should add water as a temperature control. The problem with that is of course getting the water out afterward. This entry was posted in Honey Bees. Bookmark the permalink. Post a comment or leave a trackback: Trackback URL. The frames come from BetterBee dipped in wax. It may help, I’ve had hives draw them, hives ignore them, and hives pull the wax off them to draw frames they like better. In 2003 I could see eggs through a veil. I did not have the magic glasses then. If I’m sure next year that I’m doing a split I might try suiting up without the glasses and see what I see.